Sept. 1. Members of the mint family are frequently, but not always, distinguished by a square stem and a characteristically bracing but pleasant aroma. 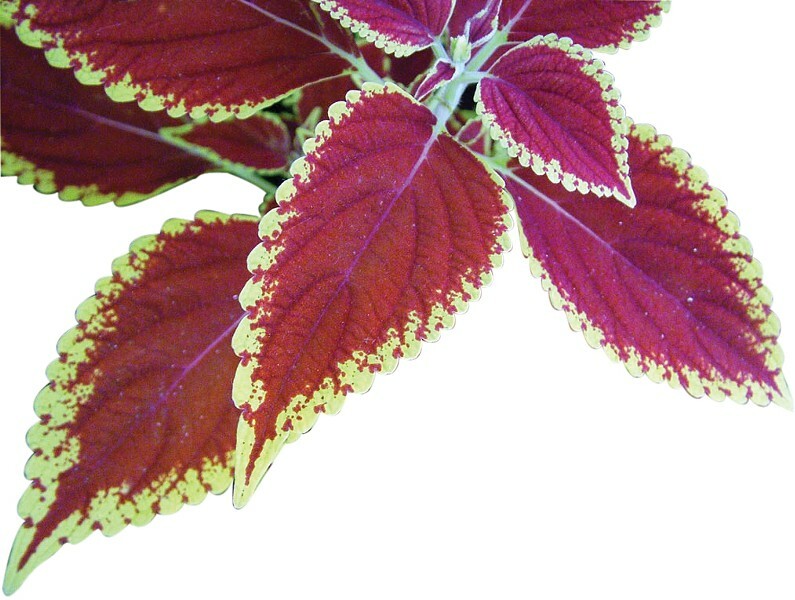 Coleus is a member of the mint family, as is Callicarpa, the American beautyberry. Sept. 2. There are those who believe that European honeybees should be allowed to have their crisis, their colony collapse disorder, their mysterious vanishment or what-have-you. They are, after all, a non-native species, bused in like tourists. Native pollinators -- solitary bumblebees that forage for food and nest in cavities in rotten wood -- could do the job, but getting them to descend upon a crop en masse is nearly impossible. American bees are individuals and opportunists. They prefer to forage alone, answering to no farmer. Sept. 3. The Most Serene Republic of San Marino, founded on this day in the year 301, is a European microstate roughly twice the size of Eureka. Situated on a hillside in Italy, the tiny nation-state is known for its ceramics and its postage stamps, which are highly sought after by philatelists. The locals enjoy a thin flatbread called piadina, and the national military is largely ceremonial. Sept. 4. The popcorn sandwich, once reserved only for children and invalids, deserves a revival. The traditional recipe calls for popcorn to be finely chopped and mixed with peanut butter before being spread on soft buttered bread and topped with sliced dates. A more modern version might leave out both the peanut butter and the dates, substituting salt and toasting the bread before buttering. When tea leaves in the bottom of a cup form the body of a mermaid, it should be seen as a warning of temptation to do the wrong thing. Sept. 5. If you planted raspberries that bear in June and September, you're awfully glad you did right about now. Remember that the fruit-bearing canes will need to be cut down later in the year so that the younger, non-fruiting canes can have their chance next summer. Some gardeners have a system to keep the canes sorted; others simply wade in with a pair of pruning shears and do their best, figuring that Nature wants to bear fruit and will find a way to do so regardless. Sept. 6. Geographically relevant palindromes: Yreka Bakery; Ukiah Haiku; UFO Tofu. Sept. 7. Not far from the Most Serene Republic of San Marino are orchards of the bitter marasca cherries, from which true maraschino cherries are made. No candied Red Dye 4 monstrosities are these. A true Luxardo maraschino cherry is a dark and bitter thing meant to be served to an 18th century dictator after dinner. Sept. 8. New moon at 3:30 a.m. Poor Dan is in a droop. Sept. 9. Vegetarian bacon is generally a waste of time. But once tomatoes are in season, even the most committed herbivore requires a BLT. A crispy, salty, soy-based product painted with pink and white stripes becomes a passable substitute, as long as it is well-hidden between the lettuce and the mayonnaise. Sept. 10. September is National Chicken Month. It seems that the chickens themselves have not been consulted in this matter, as the celebrations revolve exclusively around their plucking, dismembering, roasting and eating. If a group of chickens were to organize themselves and propose an alternate agenda for National Chicken Month (a time-consuming event, given the months that would have to be devoted to establishing the pecking order), that agenda would be more likely to include such activities as dust-bathing, egg-rolling, scratching for worms and raiding the vegetable garden. Sept. 11. Some see botanical gardens as horticultural libraries, preserving catalogs of plants, while others see them as pleasure-grounds. Some see them as centers of conservation and education; others see them as living museums. We prefer to see them through the bottom of a wine glass, and that is exactly what we will do today from 3-6 p.m. at the Humboldt Botanical Garden's Harvest Festival. Tickets may be purchased in advance or at the gate. Sept. 12. The marriage of Senator John F. Kennedy to Jacqueline Lee Bouvier took place on this day in 1953. The bride carried a bouquet of pink and white spray orchids. It has been a charming tradition at flower shows to recreate the bouquet for younger generations. Sept. 13. It is estimated that an area the size of Central Park could have fed up to 100 cold-blooded sauropods. If, however, the dinosaurs were warm-blooded, less than a dozen of them could have foraged for food in that space. There is no information on how this would have impacted the views from the upper penthouses of Central Park West. Sept. 14. The New York Sun has declared the word pantaloons to be of Italian origin and not a word of good repute in the English language. In plant and zoological taxonomy, a nomen oblitum is a name that has been unused for more than 50 years and is generally considered to be forgotten. A nomen dubium is a name of doubtful or suspicious origin. Both may be true of pantaloons; we leave it to our readers to decide. Sept. 15. James Fenimore Cooper was born on this day in 1789, and not long thereafter the world was introduced to Natty Bumppo, a man who loved the forest, loved his gun, and lived by his wits. A simple home dirt test for milk is recommended by the Chicago Department of Health. Affix a piece of clean wire netting across the neck of a funnel and place a layer of clean cotton batting across it. Stand the funnel in a Mason jar and pour the milk through the apparatus. The cotton should then be removed and placed upon a sheet of white card to dry. If there is evidence of dirt, refer the matter to the milkman as evidence of careless handling.